Recipes → breakfast → Sunday Brunch: Grilled Cheese Eggs Benny & a Giveaway! I hate to toot-toot my own horn, but this is a extra epic Sunday Brunch addition! The post title is merely Grilled Cheese Eggs Benny but that’s because I thought inside-out English muffin grilled cheese with prosciutto and gruyère with a 64° sous vide egg and lemony hollandaise was a wee bit too long for a recipe title. 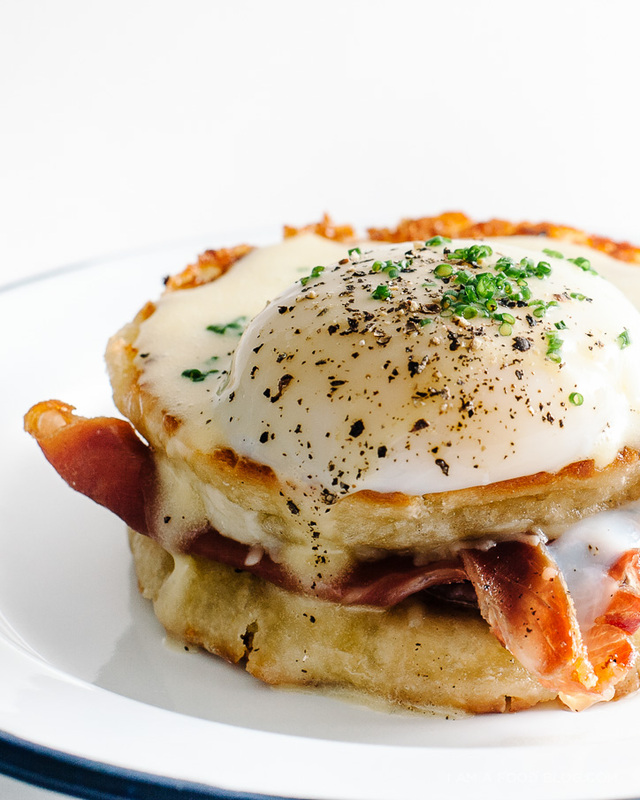 Straight-up though, this eggs benny is serious business. I have a thing for grilled cheese and brunch, so it was inevitable that I combined the two together. Presenting: the grilled cheese English muffin eggs benny. English muffins are perfect for grilling – they have a ton of nooks and crannies which brown up nicely for some extra crispness. 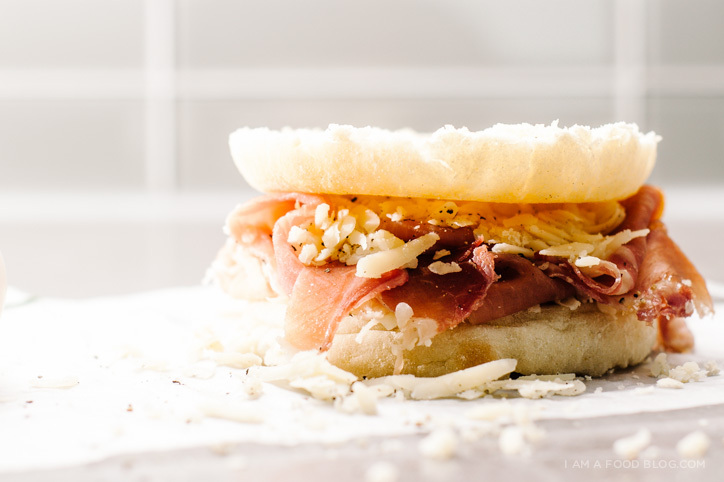 Stuff them with prosciutto and gruyère and you’ve got yourself a sandwich. To make it just that much more brunchy, an egg on top is absolutely required. I’m a big fan of slow-poached, or sous vide eggs. Yes, they take a bit more time, but you can do many eggs at once and you don’t have to stress over whether or not they will come out looking good – they look good every time. For these eggs I used a Nomiku, but you can slow-poach them with a pot (find out how here) or just poach your eggs regularly. Or, if poached isn’t your thing, just fry them up. Definitely don’t skip the egg though – a brunch without eggs isn’t brunch! you can win this finex skillet! 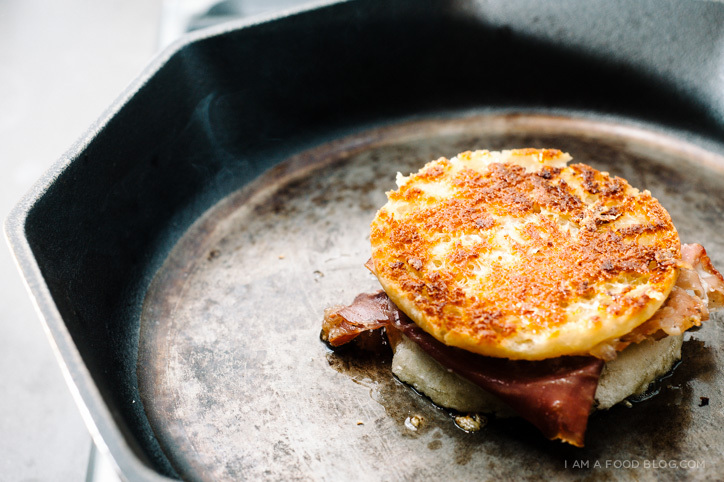 GIVEAWAY Check out this gorgeous cast iron pan I used to grill my muffin! I teamed up with Finex to celebrate my book, Easy Gourmet, launching on Tuesday. Finex is giving away one seriously awesome cast iron skillet. I LOVE LOVE LOVE my Finex and whoever wins this skillet is going to be one happy person. The non-stick release on this pan is like no other cast iron pan you’ve used and it has a handle that won’t burn you accidentally if you brush up against it. To enter: Please hop on over and take a look inside Easy Gourmet on its Amazon page and then come back and leave a comment below with what you love to cook in cast iron and why. Giveaway ends on September 6th at 12AM PDT. Open to US residents only. Winner will be chosen by a random number generator. Good luck! Update: Get ready to crisp up some bacon because you won Natalie Oh! Keep on the lookout for an email from me and congrats! On a cutting board, butter an english muffin, on the inside (the side with lot of little holes). The inside will become the side that you grill. Flip the muffin halves out so that the butter is facing the cutting board and then assemble your sandwich. Spread a wee bit (or a lot, if that’s you’re thing) of mustard on one muffin half. 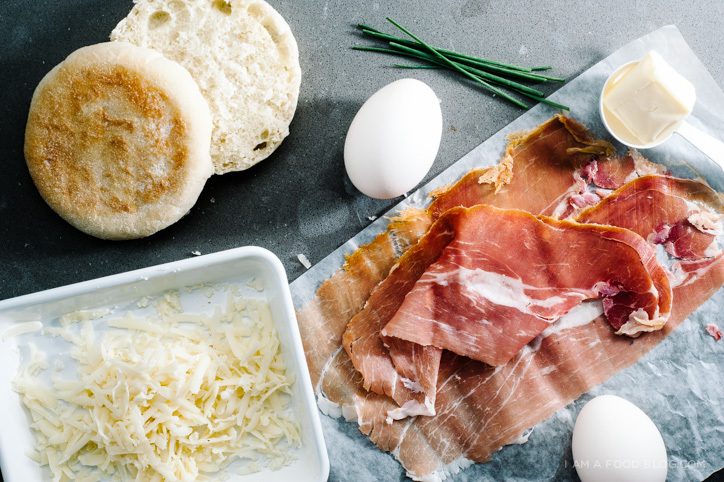 Top each muffin with a quarter of the shredded gruyère, two slices of prosciutto, and another quarter of the cheese. Top with the remaining muffin half and repeat to make the second sandwich. Heat up a non-stick pan over medium heat and carefully move the sandwich to the pan. Fry until golden brown and crispy, flipping once. Top each sandwich with a poached egg, hollandaise, chives, and freshly ground pepper. Enjoy immediately. Whisk the egg yolks, butter and water in a heavy bottomed saucepan, over low heat. Whisk constantly until the butter melts and the sauce starts to thicken. DO NOT be tempted to turn up the heat – your sauce will break if you do. Once the butter has melted, turn the heat up to medium-low and whisk furiously until it thickens. When it is thickened to your taste, squeeze in a bit of lemon. Use immediately. Fill a large pot with water and attach the Nomiku and set it to 64°C. When the water reaches 64°C, gently place as many eggs as needed into the water. Set a timer for 45 minutes. When the 45 minutes are up, remove the eggs from the water bath. To eat, crack the egg into a small dish and if there are any loose whites, tip the dish slightly to pour them out. Gently slide the egg onto your dish and enjoy! PS – If you’re interested in a sous vide machine, I can definitely recommend the Nomiku! And right now they have a kickstarter for a wifi connected sous vide machine. Plus it’s smaller and cuter too! I love a well seasoned cast iron skillet. I have family heirlooms that have never seen soap that are over 30 years old! The flavor they impart is AMAZING! I want to start seasoning my own and start my own heirloom pan! The curried chicken pot pie sounds awesome to bake up in this skillet! I love cooking potatoes and eggs, we call them bucket o spuds after a local restraint. Spuds, eggs, cheddar cheese, bacon, and leftover veggies. The cast iron adds crunch without burn to the spuds and I love my cast iron. Oh my lord this looks amazing! If you fancy coming to make me some I can put you up in Lyon…. I love to cook cornbread with jalapeno chiles in my cast iron skillet. The contrast between the crispy exterior and delicate, moist interior is incredible! Great post – love the inverted english muffins! I’ve never had a cast-iron skillet and I already know the first thing I’d make in it is a beautiful steak that I can start on the stove and finish in the oven. I love to cook burgers in cast iron because they get such a nice crust! Finally cooked some cornbread in a salvaged 8″ cast-iron and it turned out incredibly. Beats baking dishes any day for that unique sheen and crisp bottom crust! I think I’d start off with this recipe, to be honest. I just woke up and am pretty hungry. After seeing this, I may have to send my husband out for the ingredients! I have to get my hands on one of those sous vide machines. So cool! Just checked out your new upcoming book and had a hard time picking just ONE recipe to cook up in a cast iron skillet.. the classic of course is the chicken from your amazing chicken and waffle recipe..I am not a fan of peas but your pea pancake recipe looks like it can change my mind. Your pictures look mouthwatering. And to get that beautiful crispy brown on the bottom of your Spanish style potatoes and eggs recipe, a cast iron pan is a must. I just discovered your blog a few months ago and love your amazing recipes and photos. Can not wait for your book to come out! This looks so delicious Stephanie! The egg looks so tasty too! Crusty pizza! Or eggs. Or crusty pizza with eggs on top. Steak with lots of cracked black pepper…or Dutch baby pancakes. Love those too! Congrats on the new book!! I love to make any meats I can sear and finish in the oven, especially pork chops! Nice book! The pictures look so tasty. I like to make steak in a cast iron. Carrot cake pancakes… because it’s Sunday, 10 am here, and I’m hungry and I’m really craving something sweet for breakfast but don’t want to get out of bed. WHY AM I LIKE THIS. I love to cook burgers in a cast iron skillet. Makes such a nice char on them! Fajitas, I have a hard time getting the proper charring. Cast iron is great for bacon, eggs, skillet cookies, corn bread, and so much more but nothing beats a screaming hot skillet with a sizzling steak. Other pans can’t come close to the flavor and color of cast iron cooking! Pancakes are my favorite on a cast iron. Fluffy inside and insanely crispy on the outside. Especially stuffed pancakes, like shredded apples, then topped with sour cream! Hello fall time breakfasts! I am thinking most things taste better in caste iron. Brunch and toasted cheese. Yummy! Potato pancakes are my fave in cast iron! My favorite thing to make in a cast iron is a Dutch baby pancake! My go-to for a cast iron skillet is a big batch of brown sugar bacon Brussels sprouts. Nothing like it in the coldest parts of the winter! I love lasagna, corn bread and cobblers in cast iron skillet. SO delicious! Thanks so much for the opportunity. My cast iron lives on my stove. There is little i don,t cook in it. In the morning I wake it up with eggs, pancakes or sausage, my lunchtime favorite is grilled cheese and dinner….burgers, shackshuka, fish, meatballs, mini paella and the lists go on. My 15 year old pan would love a companion,it loves to cook but would enjoy sharing the workload. I’m lying in bed right now, but this actually motivated me to get up and cook this recipe. Because OMG, this looks seriously amazing!!! Pancakes, fried eggs, bacon. You know, breakfast stuff. Where to start??? Gumbo, BBQ Shrimp, Slow roasted Tri-Tip, skillet biscuits, corn bread and on and on and on! The YUM just keeps coming. Cornbread just cannot be made without a cast iron skillet. I use my pans so often that I never put them away. They stay in a stack on top of my stove. Those pulled pork pancakes sounds divine! Hmm, I would choose pineapple upside down cake! I love to cook eggs and veggies in cast iron because they don’t stick and they don’t burn either, unlike other cooking surfaces. Love cast iron and this ones like its suburb! Just ordered your book and can’t wait to get it. Will make this recipe tomorrow for my fam! Love cast iron for its heat maintaining quality and if I win there are some amazing seared hamburgers that will come out of it. Eggs. Every morning. I drive specifically out of the way to get these beautiful free range organic eggs with these glorious orange yolks that remind me of the eggs my grandpa used to have when I was a kid. I crack 3 into my cast iron pan over low heat on some butter and a crack of pepper on some thyme. I could (and do) eat it every day. Seems that cornbread is the common answer, and I’d be hard pressed not to agree. I also have a cast iron grill pan that I exclusively use for salmon. Simply unbelievable char without over doing it, and great presentation to boot. I’ve only recently discovered your blog and have been thoroughly enjoying the photography that accompanies your posts. Having been a professional cook in a past life, I’ve not been one for recipes as much as looking for inspiration and your images have spurred my inquisitive side on the kitchen to say the least. Quick observation about the recipe-for the 64° eggs, you first mention 64°C, then Fahrenheit. Sunny side up eggs! On cast iron, so much of the cooking process is letting the egg sit. I’m looking forward to making deep dish pizza in a cast iron skillet. Pancakes. The even steady heat makes them nice and crispy on the outside and light and fluffy inside. Congrats on the new book and your Saveur nod. I love making gumbo in my cast iron dutch oven. The roux browns beautifully and the flavor is excellent. I love to make blueberry pancakes! I love making simple pasta dishes in my cast iron skillet. The intense heat of the skillet transforms an otherwise everyday melange of pasta, veggies, and meat, into something complex and ever-so-slightly charred. I love cooking everything in my cast iron but my favorite thing to use it for is making a batch of fried chicken. I’ve actually never cooked with a cast iron skillet, but 2 weeks ago I had some pancakes that were cooked in a cast iron skillet and it was AWESOME. By the way I absolutely LOVE your blog and all your awesome food photography :) Congrats on the book! I pre-ordered it and can’t wait to read it. Stop!!! This looks sooooo goooooooood!!! everything, I’m a sucker for the ease of cleanup when using a cast iron! I have NEVER used a cast iron pan…I would love to, though! And I’ve preordered your book, so thinking I’d have lots of recipes to try in one…? BACON! hands down, I would make bacon in this cast iron pan. I can never get a really good, satisfying crisp on my bacon in my dinky non-stick pan. that Spanish omelette with potatoes and onions also sounds heavenly! I think the real question is, what WOULDN’T I make from your book in a good cast iron pan?! So excited to receive my copy of your book in the mail!! STEAK! Such a lovely crust because the cast iron gets so smoking hot! I absolutely love making frittatats! I love cooking and recently moved in with my boyfriend and his two guy friends. Being 27 I have yet to buy my own cast iron skillet and the boys have really only learned how to cook bacon. I was able to enjoy cooking with my previous roomate’s cast iron skillet and want to be able to enjoy the experience at my place once again! I love to make broccoli beef in big cast iron pan. Thank you for the wonderful giveaway. Ummmm I don’t think there’s anything I don’t use my cast irons to cook! My personal favorite has to be pancakes. But you can’t go wrong with cooking the rest of breakfast in the pan too. Eggs, potatoes, steak, and why not bake a coffee cake… Wow someone is ready for breakfast! Can hardly wait for your cookbook. Congrats! I love making cornbread in my skillet, especially after I’ve just cooked up some bacon. So good. I love the crispy crust. The carrot cake pancakes! I like doing pancakes in a cast iron skillet as I think it just gives them the flavor I like. But probably any of those amazing recipes that I saw in your book. Great! Mexican Carnitas are always beautifully crisped in our cast iron skillet. I love to cook peppers because they get such nice marks on them. I just think the texture would be better for some meals! Would love to try cooking with one! There is nothing like cooking up a steak with a crispy crust in a cast iron skillet. Would love to have this one. preordered your cookbook; can’t wait until tuesday! I’d love to make a giant skillet cookie for the family! Wow this brunch looks amazing! I am so making that next Sunday! As for the cast iron skillet, my favorite thing to make in it would be your French Toast with Peaches and Cream. I am a total breakfast person and love french toast! I would love a cast iron to make a skillet chocolate chip cookie. I’ve tried making them in other pans and they never get the right crust on them! Jambalaya, because cast iron browns the andouille so well and the pan can go in the oven for the final cooking. I’ve never owned a cast iron skillet before, mostly because the sheer weight of it used to scare me. But I’d love to start by trying out your French onion grilled cheese recipe on it! I don’t usually comment much on blogs, but I visit your blog at least once a day and have tried out several recipes with great success since! Pre-ordered your book and can’t wait to dig in!!!! p.s. thanks for posting about this new sous-vide contraption! Always thought it was a cooking method preserved for the experts since the tool itself cost so much! Can’t wait to get my hands on a Nomiku myself!!!!!! Happy monday! Everything is better cooked in cast iron. Heavy, yes, but nothing cooks like it. Grilled cheese seems meltier, pancakes get those crispy edges. Roasted vevetables get so caramelized and delicious. Steaks cooked on a screaming hot cast iron pan are the best I’ve ever had and that’d be the first thing cooked in the Finex should I win. Congratulations on the book! I love to make grilled cheese sandwiches in the cast iron skillet because I have a smaller cast iron pan that can be used as a press! I would like to pan fry chicken thighs in the cast iron pan to render the fat to make crispy skin. Burgers – amazing crust formation! I love cooking fried eggs in cast iron pans. My grandmother would fry bacon, use the grease to bake cornbread, remove to cool, then sauté okra, tomatoes, and onions in the same skillet, and garnish with the bacon…I try to copy it often during the summer, and feel close to her every time. Some southern fried car fish is perfect in cast iron… And maybe a side of collard greens just for good measure! i use my cast iron skillet for everything that’s polenta/eggy/wonderful! So innovative and delicious. Taking all of the best parts of an egg sandwich OMG. And your photo is stunning. I love to make dutch babies in my cast iron pan! Love the added crunch and crispiness when cooking on cast iron… sooo good! Paninis are THE BEST in my cast iron skillet! I love cast iron for nearly everything but especially collard greens and bacon, yum! I love making cornbread in a cast-iron skillet! I’m a bit embarrassed to admit that I didn’t start cooking on cast iron until I was nearly 60 years old. I have made some very tasty, nicely browned steaks in my cast iron grill pan. Love to cook anything with potatoes in a cast iron pan, especially corned beef hash… all those crispy bits, oh so yummy! I love cooking steak after it has come out of the sous vide in a cast iron. You can get it ripping hot and get a great crust in 30 seconds without worrying about cooking the inside any further. I’ve never had a cast iron skillet, but I’d love to be able to sear meat really well! Thanks, and your book looks amazing! A delicious peach or plum cobbler always bakes up nicely in a cast iron skillet. I could go on forever as i love cast irons and have different ones for different food groups. I love a thick, bone-in porterhouse in a cast iron skillet. Get that thing screaming hot, sear each side for 2 min to get that good crunch and then pop it under the broiler with a pad of garlic butter on top. Best if you have put the work into seasoning the skillet with copious amounts of bacon fat :) Love the blog, keep it comin! Love making grilled cheese on a cast iron! All the edges of the bread become a heavenly crispy dream. Eggs benedict is definitely my favorite brunch item! I have been meaning to try making it at home, yours looks so delicious! My favorite thing to cook in a cast iron skillet is fajitas. My apartment unfortunately doesn’t have a gas stove, but I love how the cast iron gets super hot and can sear meat like it’s gas! I love making cheesy biscuits on my cast iron skillet. It helps develop that crunchy layer on the bottom and sides while keeping the middle soft and flaky. I love cooking burgers in a cast iron pan! Just found out about your blogrecently… that cookbook looks great! I love cast iron, but only have a smallish 8 in skillet, which i use for basically everything that will fit in it. My absolute favorite thing to make in it is clafoutis. Brunch is the best – I could eat brunch everyday if it were allowed. I actually love making skillet noodles, so they crisp up a bit,and then smother them in veggies!! I love to make grilled cheese sandwiches in cast iron. The pan gives it a nice brown, crisp coating. I’m a breakfast food kinda guy and love it at dinner time. I would like to fry up the chicken from the Chicken & Waffles recipe in this cast iron skillet. Cast iron for the caramelization! You can’t get it anywhere else! i don’t have a cast-iron yet :( would love a chance to win one and see what i can make! my coworkers makes awesome pancakes in her skillet, so i think i would try that first! I love cooking EVERYTHING in a cast iron skillet. Burgers, omelettes… I’ve been without since I moved out of my parents’ house, afraid to splurge on one I wouldn’t like as much, but it’s been hard to live without one. I love my cast iron.. This one looks amazing! I think I would have to do your fried chicken and waffles or mini burgers… I can’t wait to check out your book! I have made your lemongrass meatballs so many times! cornbread,pancakes, eggs..everything! this looks so yummy! thanks for the opportunity! love your blog so much! Not a very exciting dish, but backyard eggs fresh from the coop cooked in a hot cast iron pot with a little butter are hard to beat. I’m pretty new to cooking in cast iron, but I do love a good sear on a hamburger, so that’s my favorite thing to cook in cast iron. Pancakes would be the 1st thing i would try. Pancakes made on cast iron are fantastic! I love breakfast for dinner too! :) Or This grilled cheese benny. The paiched egg :O YUM!!! I think cornbread baked in a cast iron is the best – it creates a crusty exterior with a tender inside crumb, delicious!! Scallops or rosemary potatoes. I have been eyeing the Porchetta recipe for a while now though! 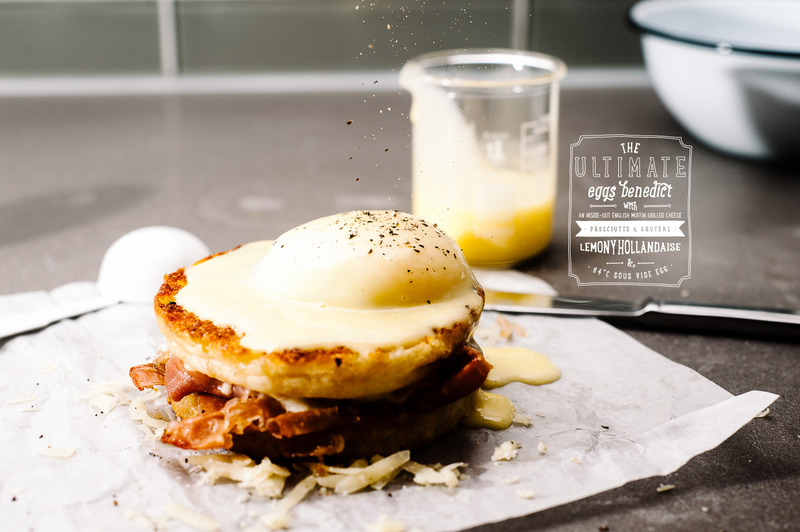 Wow, these eggs benny look OUT OF THIS WORLD. I love cooking with my cast iron Staub pan, especially to make Dutch babies! I would love to win one of these cute (and super functional) Nomiku immersion circulators. Nothing creates a nice crust like cast iron…it makes it entirely too easy to make foolproof grilled cheese! that potato frittata looks BOSS! the photography in your book is … it’s just SO YES. also, hell ya benny sauce gifs. (p.s. i really love cooking all things eggs in cast iron, but i’m also a huge fan of cornbread cooked in cast iron. it’s the only way to do it. Cast iron is so great for searing meat! Yum. Your creativity makes my eyes bug out! Love this idea girl! LOVE your blog! I don’t have a cast-iron, but I would love to try new recipes. Ordered your new book today. Can’t wait to get it! Looking forward to your next post. I love to cook dutch baby pancakes in a cast iron! I use the pan on the stove to saute some fruit, then add the pancake batter and bake. YUM! I love to cook fried chicken with it. Taste so much better! I would love this cast iron skillet. I have been wanting to make a german pancake in a skillet and this would be perfect! I love making baked beans and baking them right in the cast iron skillet! I use my cast iron skillet for everything, but I really enjoy using it to make breakfast foods (pancakes,french toast, eggs, and home fries). Peaches & cream french toast sounds amazing! I’d like making paninis in the skillet – chicken, pesto, roasted red peppers & mozzarella are the fav kind in our home! Congratulations on the cookbook! Wooohooo! I HAVE to try those chicken and waffles. That photo! Although, I’m definitely intrigued with the curry chicken pot pie too. Would love to see the photo and recipe for that. My cast iron skillet is definitely the most used pan in my arsenal. If I have to choose my favorite thing to cook in it, it would have to be grilled cheese. They come out just perfect! Oh, and eggs. And pork. Um, yeah, lots of things. The book looks great! I love making cornbread in cast iron skillets! I love cooking with a cast iron skillet because that’s how my grandmonther cooks & she’s obvi the best cook ever. I’ve never cooked in cast iron before but I’d love to learn! I love making my grandma’s recipe for biscuits ‘n’ sausage gravy. YES. Red eye gravy is also super fun to make! I love making a big chocolate chip cookie in my 10.25″ cast iron skillet. It cooks up like a cookie cake and makes the house smell awesome! I serve it warm with vanilla ice cream or a glass of milk. Everyone who has had some of it loved it. I’d like to cook a grilled flank steak in the cast iron skillet! I’d like to cook that because me and my family love steak! Carmelized onions are so good in a cast iron skillet. Cornbread just goes without saying, as well as steak. Heck, everything cooks better in cast iron. I like to cook potatoes and onions in my cast iron skillet. Nothing beats cast iron for crispy frying. The gods’ own grilled-cheese sammy is borne from the right skillet. Mom got one as a 1962 wedding gift, and no matter how much we all beat and abused it (the skillet, not the mom! ), that little firecracker just kept churning out the tastiest treats. I love to reheat leftover pizza in my cast iron, with a fried egg on top. I like making pork chops on a cast iron skillet. I love making frittatas in cast iron skillets. My cast iron favorite is the yummiest nectarine cobbler in the whole wide world. I would LOVELOVELOVE to try it in this beautiful FINEX SKILLET!! WISH ME LUCK!! Any kind of fritter or pancake! I’ve never cooked in a cast iron skillet before, but I’d be excited to try steak in a cast iron skillet! Mmmm our favorite cast iron recipe is pizza–deep dish in the pan, thin crust baked on the bottom of an upside down pan! But really, what can’t you make in a cast iron skillet? I have never cooked with cast iron but would love to! So excited for your cookbook! I love to cook bread in cast iron…I have a combo cooker and it makes for an amazing crust on the bread. Cast Iron makes everything better! Speaking of childhood comforts, for me it’s Pineapple Upside-Down Cake, specifically from a Cast Iron Pan! Ugh, just thinking about it makes me hungry. Oh my goodness, the porchetta! Congrats on your beautiful book! Gyoza made in an iron skillet is my fave! I love to cook scallops! Cast iron’s heat conductivity is like none other! I’ve yet to own cast iron, but I would slap steaks on that pan! The question should be what do I not cook in my cast iron skillet? Cornbread, potatoes, chicken… I have to try this recipe for sure! Potatoes Galette! They have the perfect combo of tender and crispy edges in the cast iron pan!! I love to use cast iron for just about anything! Grilled cheese is awesome because it leaves such a great crust! cast-ironed steak!! such a good sear! You know what notches up the yum on that bene? The grilly crunch of that muffin. Thank you cast iron. Cast iron is so perfect for steak! You just can’t get that perfect sear in any other pan. I think my favorite thing to make in cast iron is fried chicken. Great temperature regulation. I love pan frying katsu in my cast iron because it holds heat really well! My favorite skillet dish of all time is paella! Nothing gives the rice a nice even, slow heat like cast iron. And the fiery color of it looks so beautiful in the dark, textured skillet. Oven Fried Chicken! Fried in the pan and finished in the oven. Such a good comfort food when the season turns snowy and cold. there’s almost too many things to count! i love cooking and searing a great steak in cast iron :) love the blog! Cast iron was meant for grilled cheese sammies….with jalapeño and 4 cheeses…crispy yumminess! My mom always made pineapple upside down cake in a iron skillet! The BEST!. If properly seasoned they are the best non stick skillet! Cornbread is great when you pour the batter into a HOT iron skillet. I would make shrimps with a special tomatoe sauce. We got this dish from a fresh sea food store in Brussels and we love it since then. The pan would be perfect for this! Would imagine a fine plate of spaghetti carbonara coming from the Finex would be yummy. I dont currently have a cast iron skillet, but I would love to be able to go from the stove to oven effortlessly. You can make (almost) anything in cast iron! On bad days I make grilled cheese with mushrooms and onion in a cast iron skillet. Somehow the sandwich is more comforting out of cast iron. Yes, crazy but true. I am a big fan of yakiudon and would definitely serve it up in this skillet. Yum! Nothing sears a steak quite like a cast iron skillet! I make my shrimp taco filling in a cast iron. In general I don’t eat a lot of meat so I think it’s good for me to get some extra iron from a cast iron pan. I’d like to make an apple dutch baby pancake in a cast iron since you can put the whole thing into the oven. I’ve made some good fried rice where it can get crusty kind of like paella does. This one is so fun with the edges. I love to cook everything in cast iron, but especially steak; it gives such a nice seared outside. I also like how crispy chicken skin is when I brown on the stove, then finish in the oven. Cornbread, shakshuka, steak, cobbler – I love a good cast iron skillet! I love making just about everything in a cast iron skillet. Everything possible, that is. Right now…. I’m craving cornbread. It will definitely be the first thing I will make in the skillet if I win! I like to cook frittata in a cast iron skillet. That way I can cook it on the stove top and pop it in the oven at the end to broil the cheese. I like making frittata on a cast iron! I love to use my cast iron skillet to cook everything! It is so versatile! I like cooking Fried Oysters and also Fajita. I like using the cast iron skillet with the fajitas because I can cook them on the stove and them put cheese on them, stick the pan in the oven and melt it! It seems to cook things more evenly also. I have a great recipe for a cast iron skillet pizza that I want to try. I can dream about all the things I’d love to cook in a cast iron skillet, but, alas, I am without! Just the ability to cook so many different things, and to stick that puppy in the oven… Oh, to dream! I’ve been craving fajita’s lately. I think I’d whip some of those up in this skillet. i love to cook everything in my cast iron skillet but this looks seriously AMAZING! I love making cornbread in my cast iron. I want to sear a nice steak on this amazing skillet. Cast iron is my favorite thing to cook on.